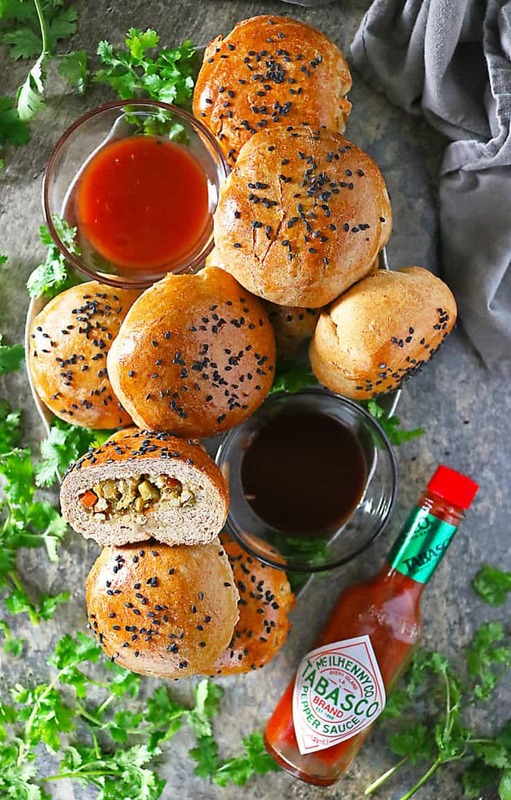 Enjoy perfectly spiced chicken, veggies and bread all wrapped up together (somewhat) neatly in these Curried Chicken Stuffed Buns ~ ideal for game-day or holiday snacking! Ever since she could read, my daughter has been obsessed with mixing sauces. She went through a phase when the only time she would eat chicken is if she had an orange glob of ketchup, mustard and mayo all mixed together on her plate. As she got older, she graduated to honey mustard and sriracha, and then onto sambal oelek and BBQ sauce! But, there was, and is, one sauce she has not felt the need to mix up with any other. And, that honor goes to TABASCO® sauce! She usually adds a bit of TABASCO® Brand Pepper Sauce to her breakfast egg tacos. 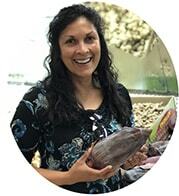 Sometimes, I’ve caught her trying to douse a bowl of roasted garlic pumpkin soup with TABASCO® Chipotle Pepper Sauce or dip Sri Lankan Fish Cutlets into a pool of it on her plate. 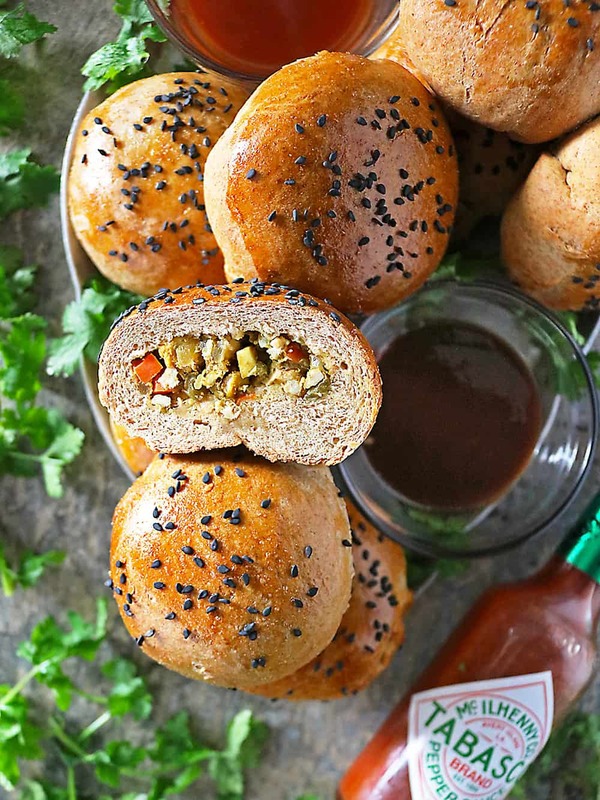 I, on the other hand, love adding it into recipes like these Curried Chicken Stuffed Buns. 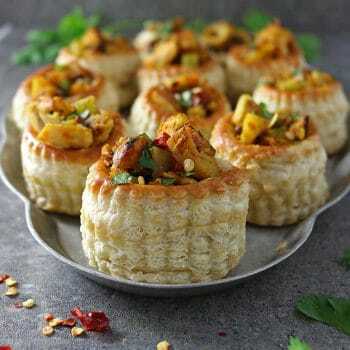 The dough used to make these buns, has a few spoonfuls of TABASCO® sauce in it, as does the Curried Chicken Filling! Did you know that this year marks TABASCO® Brand’s 150th anniversary? 150 years of being an indispensable ingredient and table top condiment that is sold in 285 countries and territories, and is labeled in 22 languages and dialects! 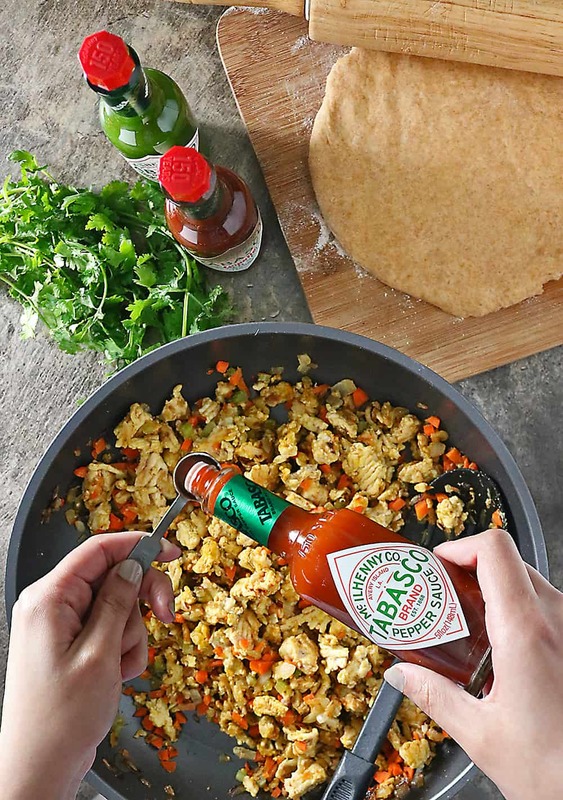 TABASCO® Sauce seems to be the one sauce that can be found anywhere in the world, adding flavor to virtually any type of cuisine. 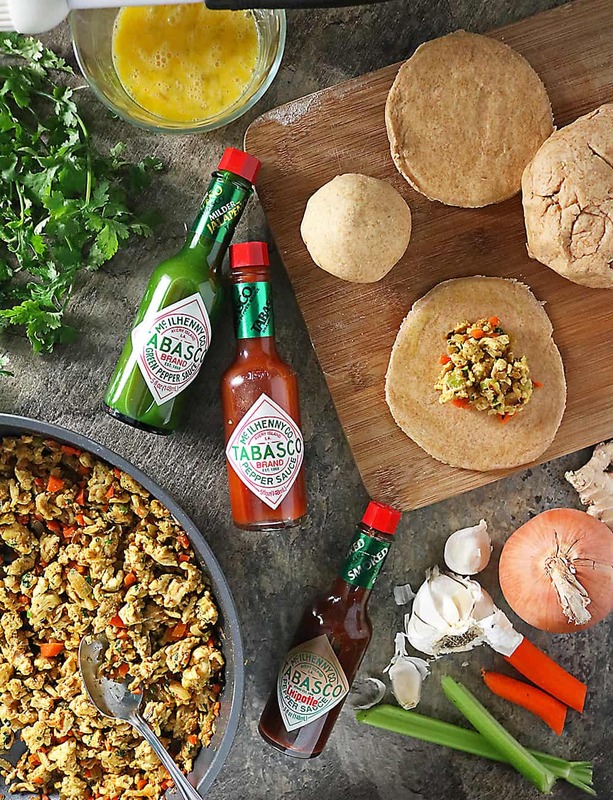 I so love how versatile TABASCO® Sauce is! 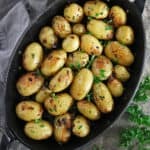 It can be used as an ingredient to enhance flavors without overpowering dishes just as well as it can be used as a condiment to help personalize dishes. 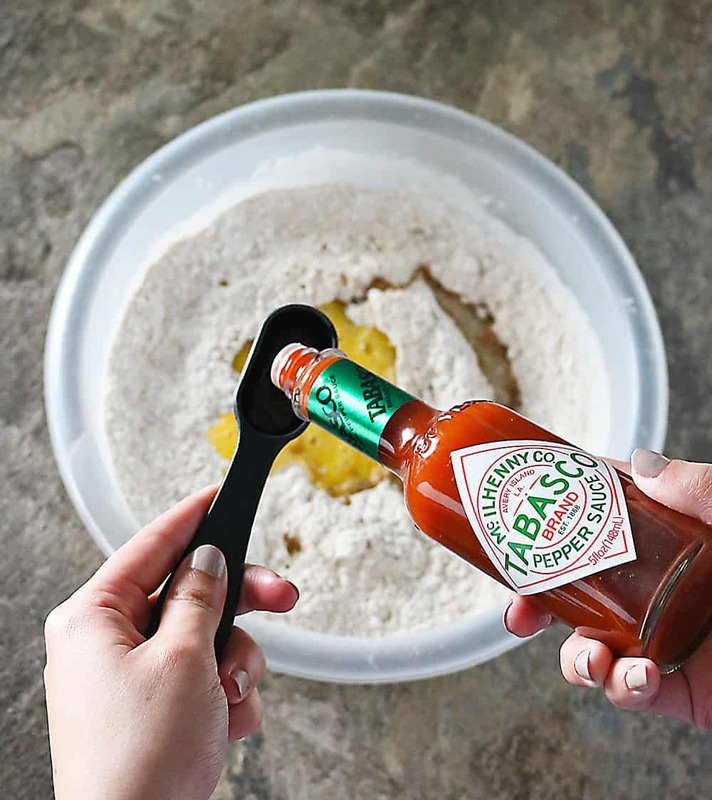 1) TABASCO® brand Original Red Sauce, which is made with just three ingredients: aged red peppers, salt and distilled vinegar. Its simple ingredients and simple processing make it the most versatile hot sauce that can be used in just about any food or drink. It is Non-GMO, Gluten free and has zero calories. 2) TABASCO® Green Jalapeño Sauce, which is made with Jalapeño peppers, for flavor that’s not too wild and not too mild. It is the TABASCO® Sauce flavor with the lowest Scoville Heat Units. It is most often used as a condiment for Mexican cuisine. 3) TABASCO® Chipotle Pepper Sauce, which is made with smoke-dried jalapeno peppers. This sauce brings a rich balance of smoke and heat. It pairs especially well with any kind of protein dish. It can be used in marinades and as a condiment over prepared meats. 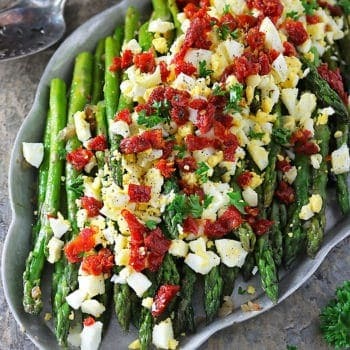 It can also be combined with pineapple for a sweet-savory dish. And, you can use ibotta to earn cash back on your TABASCO® purchases! Getting back to these Curried Chicken Stuffed Buns, my daughter and I have been on a serious stuffed bun kick. 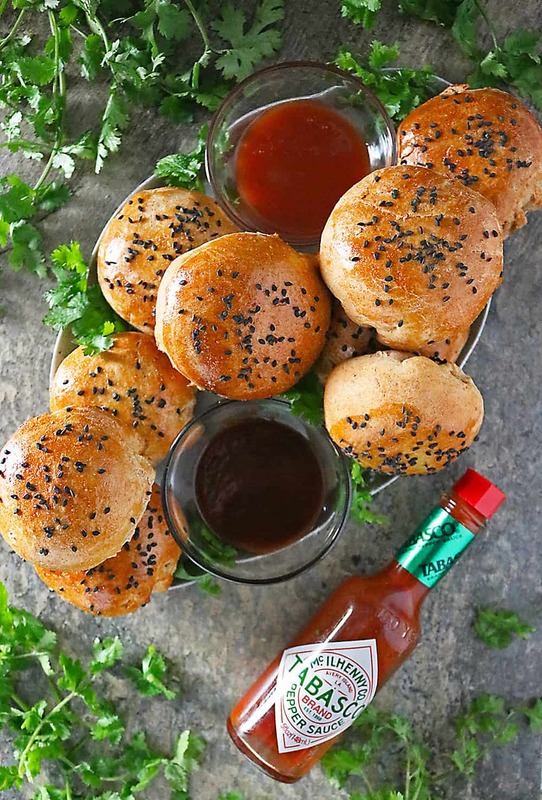 We’ve made an enjoyed several varieties of vegetarian and chicken stuffed buns, but these with TABASCO® brand Original Red Sauce in the dough, have been some of the most enjoyable. 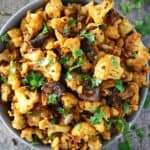 The yeast based dough is slightly sweet and slightly spicy and jives deliciously with the curried, smoky-spicy filling of chicken, veggies and spices (that I would normally use to make a chicken curry, sans the volume of coconut milk/stock). When these were ready, my daughter and I enjoyed dipping them into more TABASCO® Chipotle Pepper Sauce and TABASCO® Green Jalapeño Sauce on our plates. This holiday season, as you go about preparing holiday meals, new years appetizers or game day snacks for your loved ones, make sure to stock up on TABASCO® Sauce from your local Walmart store! Warm milk by placing it in the microwave for 20 seconds or so, so it is lukewarm - you don't want it hot or it will kill the yeast and your buns won't rise. Add sugar to milk and mix well. Then add in the Active Dry Yeast and set aside for 10 minutes. The yeast should have "ballooned" by this time and be frothy. Add 1 cup all purpose flour and 1 cup whole wheat flour to a bowl and then add the milk/yeast mixture to it. Mix with a wooden spoon. Then add in 1 (one) egg, salt, TABASCO® Brand Pepper Sauce, and melted butter (I melted my butter by placing it in the microwave in a microwave safe bowl and microwaving it on 20 second intervals until it was melted). Add in the rest of the wheat flour and all purpose flour and mix well. At this point you can set the spoon aside and use your hands to knead the dough. When dough is slightly tacky, place it in a large greased bowl. Wrap bowl with plastic wrap. Place a warmed towel over it and place in a dark dry place for 1 hour to proof. While this is proofing you can make the filling. 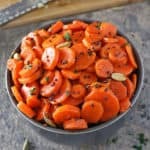 Add oil and chopped onion to a pan and saute about 10 minutes, then add in the garlic, and ginger and celery and carrots and saute about 5 minutes. 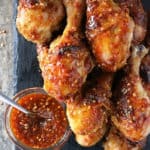 Than add in the TABASCO® Brand Pepper Sauce, coriander, cumin, smoked paprika, turmeric and stir well and let saute about 10 more minutes or until chicken is cooked through. Finally add in 2 tablespoons full fat coconut milk (and stir well. When the dough has proofed and has doubled in size, remove the plastic wrap and towel and punch dough down. Then, split dough in 2. Wrap one part with plastic to keep moist and spread the other one out using a rolling pin. Use a bowl to cut circles into dough. Spoon 2 or so tablespoons of filling into each circle. Seal the buns by brushing with egg wash flipping the sides over the filling and pinching them together. Then lay buns down, with sealed side on the bottom on a parchment lined baking tray. Repeat until all the dough and filling are used up. Preheat oven to 175 degrees, place a damp towel over the stuffed buns and place them in the oven to proof for another 30 minutes. When they are done, they should be slightly bigger. Remove them from the oven and preheat oven to 375 degrees. Beat the remaining egg and brush it over the buns. Sprinkle buns with sesame seeds and place in 375 degree oven for 20-22 minutes. So yummy! I usually fill them with thick chili con carne, but love your version curried chicken filling even more! I actually did know that this is Tabasco’s 150th anniversary! I mean I lived in south Louisiana for a while…you just have to learn the value of Tabasco in recipes. 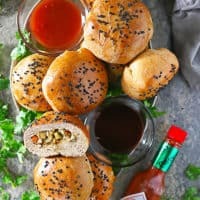 🙂 Speaking of recipes, these stuffed buns sound amazing! You’ve got so much flavor going on here, Shashi. Sign me up for a batch of these, please!